OKLAHOMA CITY (AP) Carmelo Anthony is getting comfortable in his new role. 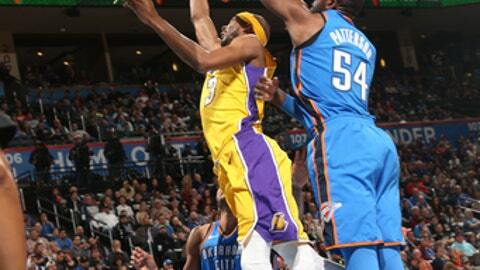 He scored 27 points to help the Oklahoma City Thunder beat the Los Angeles Lakers 114-90 on Wednesday night. Anthony became one of the most prolific scorers in NBA history by playing mostly isolation ball, but coach Billy Donovan has asked him to become more of a catch-and-shoot scorer. It worked in this one – the 33-year-old forward made 10 of 15 shots overall and shot 4 of 6 on 3-pointers in one of his best performances of the season. Lakers rookie point guard Lonzo Ball sat out his second straight game with a sore left knee. The Lakers are 0-8 when he doesn’t play, and they have scored fewer than 100 points in six of those games. The injury news got worse for the Lakers. Kuzma left with a finger joint sprain and did not return, and forward Kentavious Caldwell-Pope left with a right Achilles tendon strain and did not return. Seven of Adams’ rebounds were on the offensive end. The Thunder have gotten used to him bailing them out. The Thunder led 60-54 at halftime behind 16 points from Anthony and 14 from Adams. Westbrook had just two points until scoring eight in the final three minutes of the second quarter. Oklahoma City started strong in the second half. A 3-pointer by George bumped the lead to 11, and a 3-point play by Westbrook midway through the quarter pushed the margin to 14. Westbrook got Corey Brewer off balance with multiple crossover dribbles before blowing by him for a layup that gave the Thunder an 86-70 lead. A 3-pointer by Anthony made it 91-70 and forced the Lakers to call timeout late in the third quarter. The Thunder controlled the game the rest of the way. Lakers: F Brandon Ingram returned after missing a game with a mild left ankle sprain. He had eight points in 26 minutes. … Shot 55 percent from the field in the first half, but just 47 percent in the game. … Caldwell-Pope scored 10 points in 15 minutes. He was one of two Lakers to score in double figures. Thunder: Boxer Floyd ”Money” Mayweather attended the game. … G Andre Roberson returned after missing eight games with left patellar tendinitis. He finished with four points and three steals in 17 minutes. The Thunder committed just one turnover in the third quarter and outrebounded the Lakers 16-7. Oklahoma City took six more shots than Los Angeles in the period and outscored the Lakers 33-18. The Lakers host the Pacers on Friday. The Thunder play at Cleveland on Saturday. More AP basketball: https://apnews.com/tag/NBAbasketball .